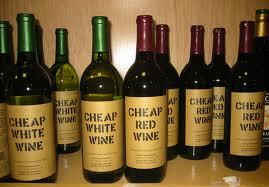 So is Cheap Wine any good? What is "Two Buck Chuck?" Most “wine snobs” have an attitude that cheap wine or wine made in large quantities by an industrial-scale producer can’t be worth drinking. And I used to think that if a bottle of wine costs $150 it has to be better than a bottle that costs $2. At least that’s what I used to think. I have read so many stories of people doing blind tasting with no information about the wines and without knowing anything about the prices, where the results are usually in favor of the $2 bottle rather than the $150 bottle. They tend to think the cheaper wines taste better. For me, your everyday Jane, I personally don’t have a problem with cheap wine. In fact, some of it I actually like. Or maybe it’s that I’ve grown to like it. I mean, let’s face it, in this economy most people can’t afford to drink $20 plus bottles of wine. In my quest for inexpensive wine, I’ve come across a few decent ones, but I’m going to share with you the three cheapest ones I’ve found. It’s funny because I have a friend who certainly knows a thing or two about wine, but I decided to put her through a little test. I invited her over for a glass (or two) of wine one evening. In the refrigerator I had a bottle of Edna Valley Chardonnay (about $12) and a bottle of Sterling Vineyards Chardonnay (about $13) right there in plain site on the top shelf. Hidden down below I had a bottle of Charles Shaw Chardonnay ($1.99 a bottle). I asked her which one she’d prefer, she chose the Sterling. I took it out of the fridge and proceeded as if I were going to open it. I told her to go out into the living room and check out the new pillows I had just purchased for my couches. As soon as she left the kitchen, I switched the bottles, opened the Charles Shaw, poured two glasses, and headed out to the living room to join her. After awhile we finished the glass and I offered her more. She said, “Absolutely”. That right there was when I decided to blow the whistle. She couldn’t believe it. Now don’t get me wrong… This is not my first choice for wine but when it comes to cheap wine and if you only have a couple bucks, then this is the one I’d choose. Can you suggest a good inexpensive wine? Tell us about your pick for a descent cheap wine.